How to Design a Product for Free! Did you know it is possible to design a cool new product for free? Yes, it is true, but with a very big caveat—you need deep expertise in the intricacies of product cost savings. Investing that expertise on your project is well-worth it, because you can make your money back in production cost savings. Why Focus on Future Manufacturing Costs? 2) Contract Manufacturers (CM's) will definitely not help you reduce product cost. 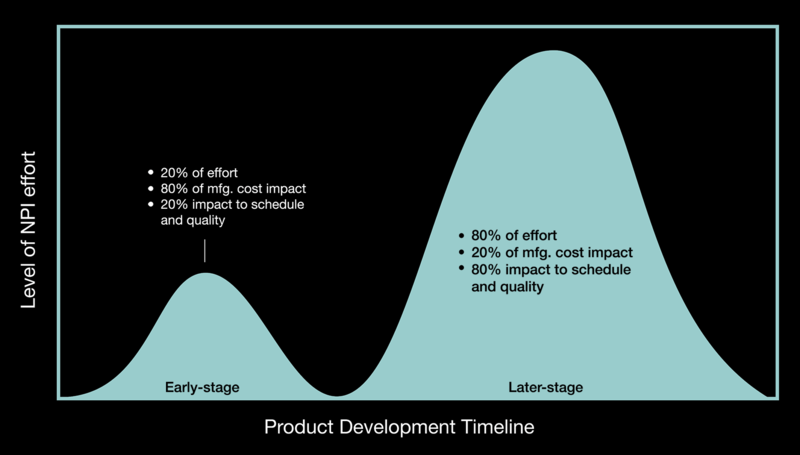 Developers love to freeze specifications and design approaches early, necessitating early involvement in cost reduction trade-off optimizations for the design, before decisions with downstream impacts to cost are set in stone. Who best to work with the developers? You need Design for Manufacturing (DfX) & New Product Introduction (NPI) engineers. Check out the double-hump chart showing key differences in level of effort and cost impact depending on where you are in the development cycle. NPI is all the work done to support the end game of manufacturing and shipping great products. The smaller hump on the left indicates a smaller amount of effort, but this is by far where the greatest opportunity for cost reduction lies. Early involvement, termed DfX at this stage, provides increased opportunities to reduce costs of components, labor, test equipment, repair, scrap, customer support, and warranty.An example of critical DfX work is in the sub-category of Design for Test (DfT), where it is critical to ensure that sufficient physical access to circuits and low-level diagnostic FW are part of the development plan. Early involvement, termed DfX at this stage, provides increased opportunities to reduce costs of components, labor, test equipment, repair, scrap, customer support, and warranty. Later stages (the bigger-effort hump) provide cost savings opportunities from earlier production start, faster production ramp, higher production throughput, and improved process yields. But, all this may amount to only 20% of the total cost reduction that could be achieved. The overarching goal for your project is shorter time-to-profit. Contract manufacturer revenue is directly linked to product cost. The higher the cost and more labor needed to make a product, the more revenue they’ll make. This incentive is balanced by their revenue also being linked to unit sales volumes, so products need to hit realistic cost targets, but this effect can be minimized by minimum order quantities and other measures. Tooling and assembly fixtures are needed, so you should see those costs broken out. If not, find out what other costs include those. Product cost, often called Cost of Goods Sold (COGS), can be improved on nearly every project. Experts in cost optimization tradeoffs are required, not only early in the design, but also later to interact with the CM. 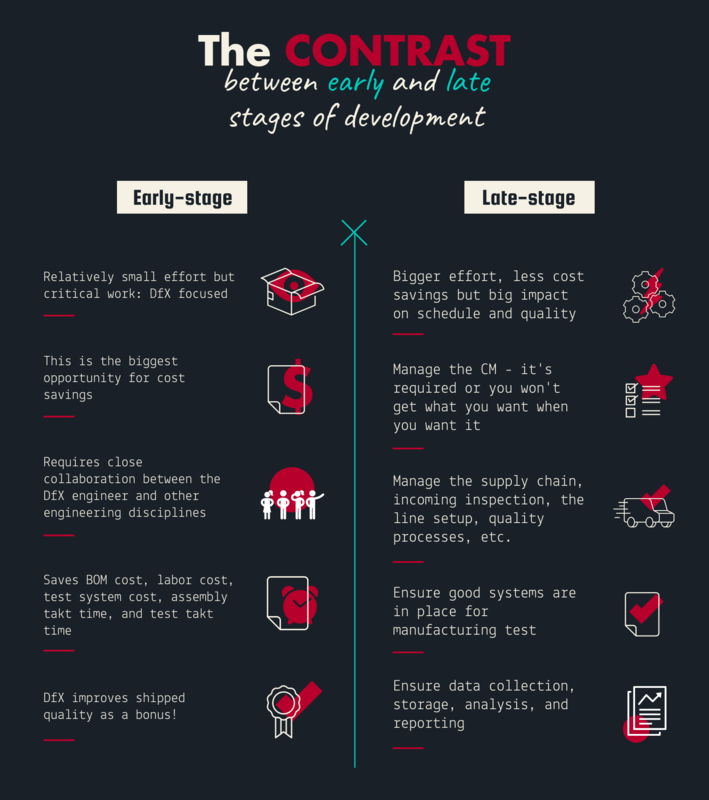 Depending on the parameters of the product you envision, you may be able to get full payback on development costs by reducing production costs, which are often much higher than development costs. For development costs ranging from $500K to $3M across a spectrum of shipped product volumes, the chart below shows the required per-unit COGS reduction to cancel out the development cost completely. 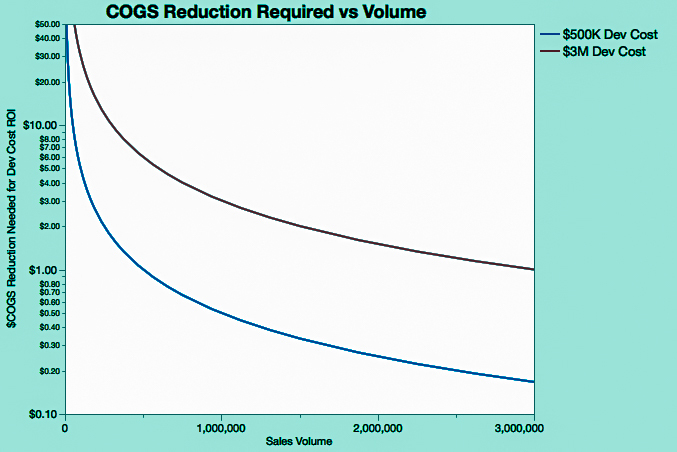 For high-volume products (e.g., >500K), a COGS reduction of <$2 can achieve design cost ROI. For lower volumes (e.g., <100K), you may need an $8 or more reduction in COGS to get the same ROI. To summarize, of course you're not actually going to design a product for free. You need the funds to pay for design costs and production costs—each of these can be substantial. However, this article does describe how the right investments during design can have a dramatic effect on overall costs. Though it may take 1, 2, ...? years to fully recoup the return on your design investment, your real payback begins when you get revenue from sales, which kick in shortly after production begins.